Nov 01, 2018 (LBO) – New Ambassadors of the United States, Japan, France, and Afghanistan have presented credentials to President Maithripala Sirisena today at the President’s House, Colombo. 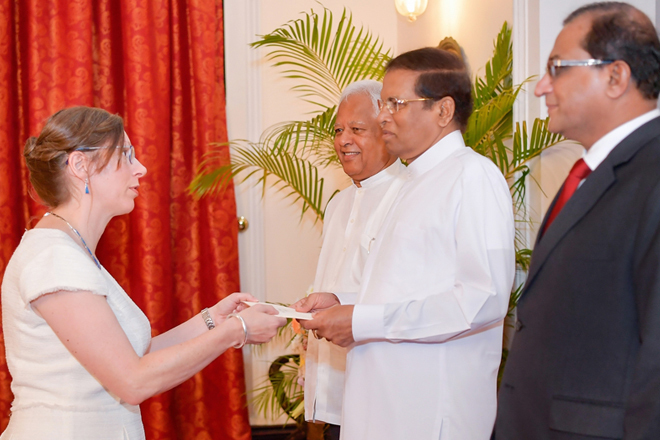 Foreign Ministry said the United States with the concurrence of the Government of Sri Lanka, has appointed Alaina Teplitz as the Ambassador of the US to Sri Lanka in succession of Atul Keshap. The government of Japan with the concurrence of Sri Lanka has appointed Akira Sugiyama as the Ambassador of Japan to Sri Lanka in succession of Kenichi Suganuma. The Government of the Republic of France has appointed Eric Lavertu as the new Ambassador in succession of Jean- Marin Schuh. Afghanistan has appointed M. Ashraf Haidari as the new Ambassador of Afghanistan to Sri Lanka in succession of Azizuddin Ahmadzada.